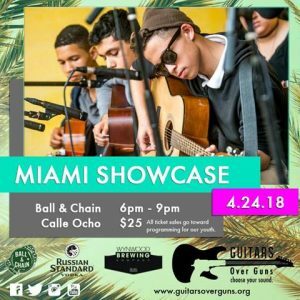 Ball & Chain, Little Havana’s most notable live music venue, is thrilled to host the annual Guitars Over Guns Student Showcase event on Tuesday, April 24, at 6PM to 9PM, for the second year in a row. Guitars Over Guns (GOGO) is a Miami-based 501(c)(3) non-profit that provides mentoring to at-risk youth through music education and performance. Currently, Guitars Over Guns provides programming at North Miami, Georgia Jones-Ayers, Citrus Grove, and Cutler Bay middle schools, as well as the Educate Tomorrow Center and Camillus House. 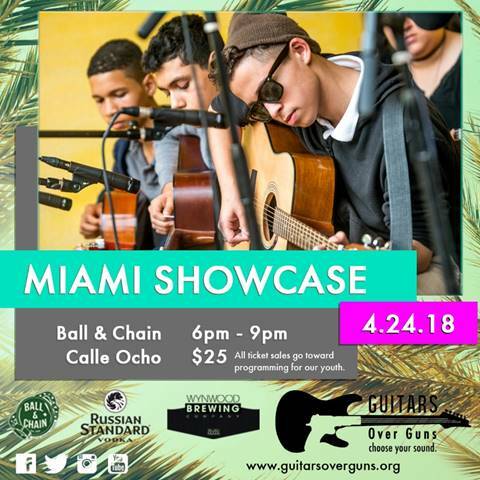 Students from Guitars Over Guns’ middle school programs across Miami-Dade County will converge for the annual Guitars Over Guns Student Showcase event. From student artwork on display, to dance and musical performances on Ball & Chain’s iconic Pineapple Stage, these young artists from Miami’s underserved communities will impress guests with their talent, exuberance, and professionalism. All ticket proceeds will be donated to GOGO for future programming; For more information and to purchase tickets, visit www.guitarsoverguns.org. Follow @guitarsoverguns and join the conversation with the hashtag #ChooseYourSound. Award-winning Chef Jose Mendin welcomes James Beard Award nominated Chef Clay Conley of Palm Beach restaurants Buccan and Grato to Pubbelly Noodle Bar Miami Beach for a friendly 8-course battle of Noodles vs. Pasta. The dinner is the most recent incarnation of Chef Mendin’s Mendin & Friends guest chef series taking place on Tuesday, April 24 at 7PM. Each chef will prepare one appetizer and three dishes. Chef Mendin, best known for seamlessly fusing his Latin influence with Asian flavors, will dish out selections such as Hearts of Palm “Caesar” Salad – boquerones, Parmigiano, fried bread; Blue Crab Ravioli – yuzu broth, royal trumpet, bottarga; Spring Onion Gnocchi – peas, prosciutto, taleggio, black trumpet, pistachio butter; and Gumbo Black Fettucine – crayfish, prawns, andouille sausage, ramps, cornbread crumbs. From Chef Conley: Softshell Crab; Carrot Agnolotti – brown butter, king crab, Thai basil, black garlic; Squid Ink Orecchiette –sausage, Turks & Caicos conch; and Udon “Carbonara” – spring vegetables, ramp dashi butter, egg. The dinner is $70 per person (excluding tax and gratuity). Reservations are required and can be made via OpenTable or by calling (305) 532-7555. Seating is limited. Miami Dolphin Reshad Jones will be hosting the grand opening of South Florida’s newest bowling entertainment destination – Bowlero Davie (located at 8200 W State Road 84). The revamped bowling alley’s official grand opening will be taking place next Saturday, April 28th from 11AM – 2PM. Bowlero Davie offers a new spin on the traditional bowling alley. The brand new center features 32 backlight bowling lanes complete with high-definition video walls at the end of the lanes, plush lounge seating, a completely new bar and lounge area, as well as a revamped arcade.The grand opening event will have free bowling, arcade play, food and drink specials, and the chance to bowl with NFL surperstar Reshad Jones, to celebrate the completely revamped center; For more information on Bowlero Davie, visit bowlero.com.